Ready to go on an adventure? 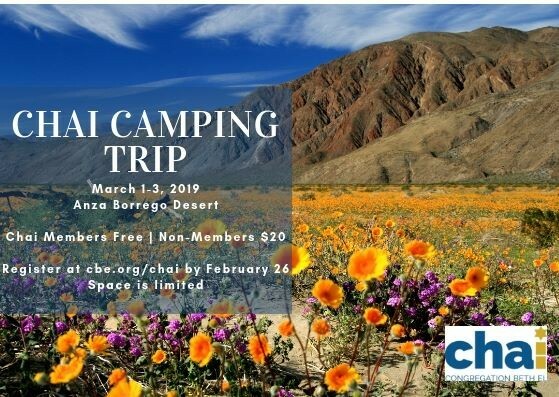 Join Chai March 1-3 for our annual Chai Camping Trip lead by community member Brian Remas. We will spend 3 days in beautiful Anza Borrego Desert that will be bursting with wildflowers. Come and enjoy the cool waterfalls in the oasis, hikes, or simply relax at the campsite with Chai friends. This is an all-inclusive trip, and we will be providing food, water, and the campsites. We will be staying at the Borrego Palm Canyon Campground that is equipt with flushing toilets, showers, and more. Some camping equipment and transportation will be required. Space is limited so register today!